BETTER PRODUCTION Shops Using Technology 112 MMS December 2016 mmsonline.com wax, you cannot really put any significant sideway machining forces on the part. 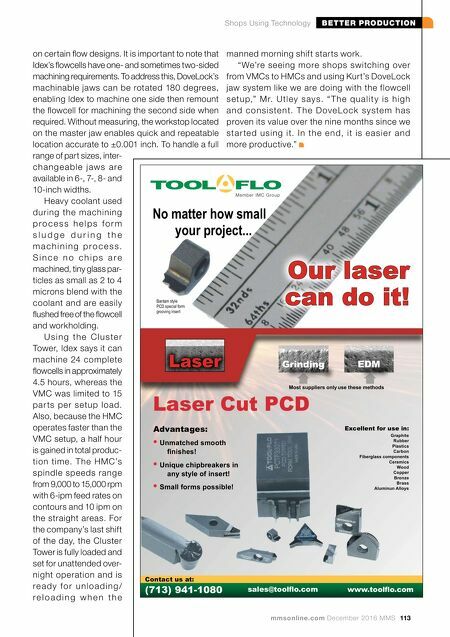 So, to achieve the flowcell, the machining operation we devised is more like a sideways grinding operation." Grinding generates heat, so it is necessary to use the right grade of wax to protect the glass and hold it sufficiently, avoiding vibration without the wax melting or softening too much for the grinding (milling) operation, he says. Along with producing more parts, the new setup is said to have reduced as many as four operations Custom tools are required for contouring the flow- cell component. These short tools add to manufac- turing stability with their ability to operate closer to the flowcell surface and minimize vibration. 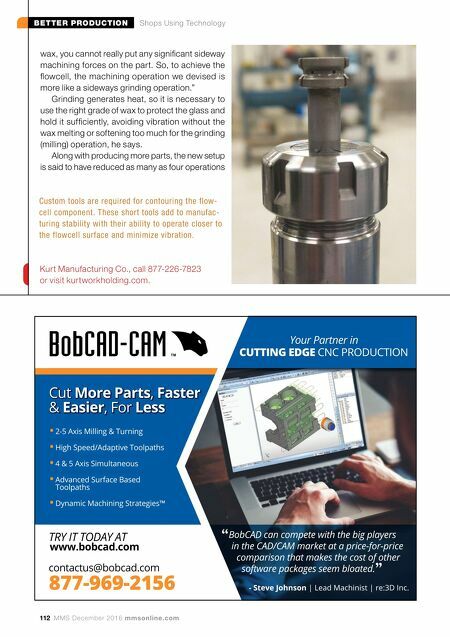 Kurt Manufacturing Co., call 877-226-7823 or visit kurtworkholding.com.